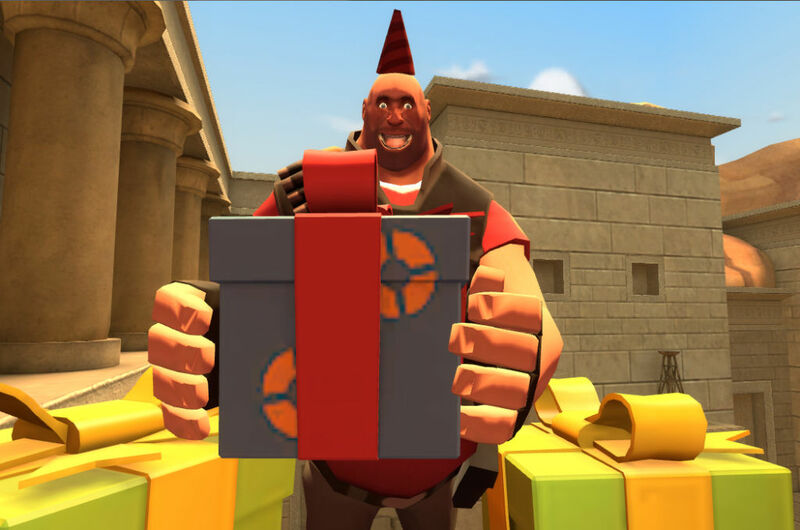 Team Fortress 2 Gift Ideas! If you’re anything like me, you like buying gifts for people for Christmas or other related holidays. If you’re also like me, you’re a tiny bit forgetful, and all the planning in the world can’t stop you from remembering to get that present. If you’re also like me, you probably made a load of gifts this year, because you’re good at that stuff. For everyone else, all we can do is buy gifts. Let’s have a look at some nice gift ideas! Before we start, a quick note on wrapping gifts. It’s an optional thing, but it’s always nice, and gives your gift that little personal touch. Of course, handing them over through the trade window is fine as well, as it’s the thought that counts, not the method of delivery. Remember though, when trading wrapped gifts, people can see what’s inside them. First up, the customized hat. This one’s nice and easy to do, particularly since hats are mostly quite cheap these days. While any old hat will do for the friendly stranger, a hat for a closer friend ought to fit them. Consider what colours they like, what class they play as and what items they already have before making your purchase. Adding custom names and descriptions adds a hint of romance to the mix. For bonus points, get them a Strange Hat, which counts points and is actually slightly useful. Next, we have the customized weapon. With the introduction of weapon effects, in the form of sheens and oh-my-god-my-eyes-are-on-fire Killstreak Sets, as well as Strange Parts, Strange Weapons, Vintage Weapons, Genuine Weapons and so on and so forth, you can get an almost completely personalized weapon. While most Strange Weapons are relatively cheap and work great if you get a weapon for your friend’s favourite class, if you want to add strange parts and killstreak effects, it does start to add up. The good parts are generally rather expensive, particularly if you’re looking for Headshot Kills or Critical Kills or something. For the more insane gift-sender, there’s always Collector Weapons, which involve collecting 200 of a single weapon and crafting them together for, um, some red text. Oh well. It’s the thought that counts. Moving up a notch, we have the Pile o’ Gifts. And the Secret Saxton. And the Pile of Key gifts. And the Pallet of Crates. These are slightly different gifts, as they are given out randomly in a single server. If you’re insane enough to do this, get 23 of your friends into a server, preferably one you own or are a regular on, and give that stuff away! There’s a slight downside to this though. The Pile o’ Whatevers only give out 23 items, so if there’s more than 23 people other than yourself on the server, you’ll miss out. There’s also a chance of someone receiving a Secret Saxton in a Pile o’ Gifts, as proven by the Secret Saxton in my own backpack. But if you have money to spend, why not? Going in a completely different direction is the Something Special for Someone Special. Unless you’ve already proposed to your partner, you both play TF2 regularly, you don’t mind looking like a fool and you have money to burn, don’t bother. It’s not worth it. Plus, most people just use these to make crappy jokes. Talking of expensive items, unusual hats make the perfect gift for a really good friend, or lots of friends if you’re rich. Problem is, unlike getting someone a normal hat, unusual hats can quickly skyrocket in value, depending on what you want. While an Otolarynologist’s Mirror will generally cost you about a bud and a Geisha Boy about the same, good luck if you want a Vintage Tyrolean. This is more a gift from the super rich. Let’s finish off with some more affordable ideas. How about a Poly Count set, which leaves a calling card to anyone killed by them? Or, for the really simple gift, how about a single key? 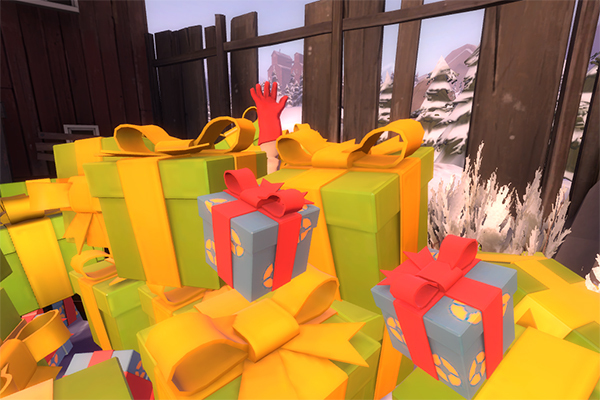 Maybe your friend will unbox an unusual! Or not. Keys aren’t great presents. Tour of Duty tickets though are good, particularly if you offer to play with your friend. In the same spirit, Dueling Kits work well, particularly if your friend thinks they’re a better Soldier than you. The great thing is, most of these gifts can all be paid for using in-game items, bought by saving up metal and hats and trading them for what you want. But who says you have to spend anything at all? Nothing says “Happy Holidays!” more than something you’ve made, whether it’s a story, a picture or a silly video of you prancing around in a Santa hat. A tip: Buy Tour of Duty tickets, sell 2 for a key, give key. One key for 1/3rd of the price.